Porridge. We all have childhood memories of the stuff, even if it’s just about three picky bears and a golden haired cheeky girl that ate their breakfasts… My stand out porridge memory is from when I was super young, probably around 4 or 5, and we were on holiday with my aunt, uncle and cousin on the Isle of Wight. We were staying in this little cottage-chalet thing that I’m pretty sure had a little set of steps up to the blue door. There was a back garden that was majorly overgrown so we couldn’t really play in it, it was pretty jungle-esque. My brother was still in a buggy and my sister wouldn’t arrive on the scene for a good few years. It was my uncles turn to sort breakfast and he made porridge in a pan on the hob, something I hadn’t seen done before (we weren’t porridge eaters in my house). He served it and it was bloody awful. It was a lumpy, stodgy, hard to swallow creamy mess in a bowl. I remember my mum realising it was bad but I don’t remember if she found an alternative or left us in porridge hell. From then on, my porridge adventures were pretty much limited to Ready-Brek covered in a layer of crunchy sugar (hello freezing cold mornings dragging my sorry arse to primary school) and later in life OatSo Simple. Honestly, until recently it never crossed my mind to make porridge ‘from scratch’. However, this newer version of myself values breakfast immensely and I focus very much on what I can eat that is going to fuel longer runs, hiit workouts and basically stop me hitting the chocolate mid-afternoon (this doesn’t always work – it’s 3.15pm and I’ve got a bar of Ombar chocolate next to me… but at least I’m not scoffing like 4 Cadbury Flakes right now). So a few weeks ago I made porridge. And from then on I’ve been addicted. I’ve had it every day and I’ve made the time to even make it on my super early market mornings (my day job involves making and selling gourmet brownies at farmers markets). It is SO EASY AND SO SIMPLE. I can’t believe I’m 31 and I’m just realising the amazingness of porridge. 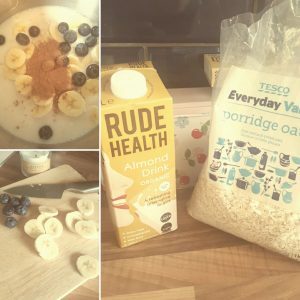 My go-to recipe is below along with lots of ideas for changing it up depending on your personal tastes – go wild with porridge! When the milk is all absorbed into the oats and the banana is half melted in, it’s ready! Pop the porridge into a pretty bowl, top with the remaining banana and gobble up! Add blueberries to the mix and on the top! Add half a tablespoon of raw cacao powder! Try a different nut milk! Add cinnamon, ginger or nutmeg to spice it up a little! Try any other fruit – grate an apple, slice up strawberries… use up whatever you have! Top with toasted flaked almonds, or try chopped hazelnuts or pistachios for a crunchy addition! Add desiccated coconut to the porridge at the cooking stage and top with chopped pineapple or sliced apricots! The possibilities are endless… my personal favourite at the moment is adding a bit of raw cacao powder and some blueberries along with the banana. Then I top with blueberries and banana – it’s a sort of banana-blackforest-esque masterpiece! 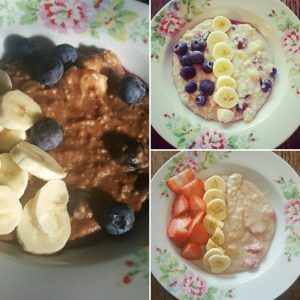 Let me know what you try and how your porridge making antics go!